A deposit of super-hard diamonds located in an asteroid crater between Krasnoyarsk Territory and the Republic of Yakutia in Russia’s Eastern Siberian region has finally been declassified. The deposit, knowns as the Popigai Astroblem, was discovered in the 1970s, but Soviet scientists decided to keep the find secret since, according to geologist Alexander Portnov, they did not know the best way to make use of the diamonds. Typically naturally occurring diamonds are not suitable for industrial use because of their unpredictable and non-standard characteristics. Today, however, experts agree that the unique properties of these diamonds make them suitable for use in high-tech optics and electronics. “Research into impact diamonds had been classified for a very long time, because the reserves are immense, but [Soviet] scientists did not believe they could be used in industry. The very possibility of their application in the manufacturing sector is a sensation,” said Portnov. 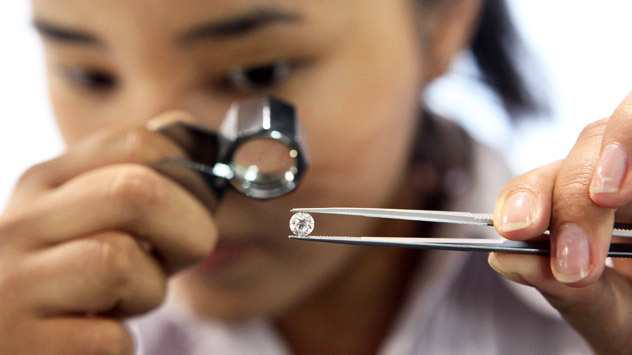 Industrial use of diamonds is very high, amounting to approximately 5 billion carats, but most of these diamonds are produced artificially, said Sergei Goryainov, an observer at the Rough&Polished diamond information and analysis agency. “Industrial diamonds have multiple applications, but the thing is that successful crystal synthesis experiments resulted in appearance of numerous synthetic diamonds with tailor-made properties. When you extract natural diamonds, you can never be sure about the exact properties. The share of natural diamonds on the market for industrial crystals has been shrinking for a long time now, and is currently quite insignificant,” Goryainov said. Despite the overall industry preference for synthetic diamonds, a few big corporations have expressed an interest in the rediscovered deposit, said Nikolai Pokhilenko, director of the Novosibirsk Institute of Geology and Mineralogy. “They have peculiar properties. They are harder, much harder than the ordinary diamonds we all know. They can revolutionize the tool-making industry, drilling, processing of solid substances, because it is the hardest natural material known to us. They can be applied in high-tech industries: electronics, optics, production of high-precision lenses. We see excellent prospects and some big corporations, such as De Beers and some Chinese companies, have already shown an interest,” Pokhilenko said. Scientists believe that the declassified Popigai Astroblem has enough diamond reserves to meet for the entire world’s demand for the next 3,000 years. First published in Russian in Kommersant FM.